They're back by popular demand!!! 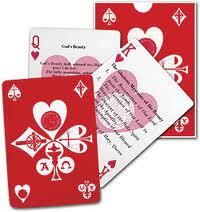 The Catholic Doctrine Playing Cards are a great way to ease folks into learning more about our faith and traditions! Each and every card in the deck provides you with prayers, reflections from our great saints, a listing of the 10 Commandments / Beatitudes, an explanation of our Vices / Virtues, etc. Created by a priest specifically to help others learn more about Catholicism, these are A+ all the way!!! Can be purchased from 101 Foundation.